Singaporean swimmer Joseph Schooling has won Singapore’s very first swimming Olympic Gold Medal at the Rio 2016 games in the Men’s 100m butterfly race! He even set a new Olympic record at 50.39s! He beat favorites Michael Phelps (USA), Chad le Clos (RSA) and Laszlo Cseh (HUN). Amazingly, these 3 contenders tied for silver, what are the chances of that? I can’t be prouder of Singapore’s Olympians after seeing Joseph Schooling holding his gold medal up. Oh wait, I take that back. 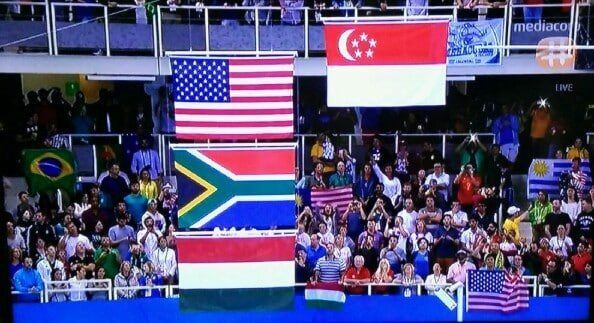 The Singapore flag at the top during Majulah Singapura made me tear. Looks like I wasn’t the only one tearing. Do you know how HARD it is to train your entire life as a competitive swimmer, and finally reach your goal of an Olympic medal, with an Olympic record thrown in too? Here’s another shot of Joseph Schooling standing proud for Singapore. It’s an amazing honour to be able to compete as a national athlete for Singapore and bring home the glory for your country. Schooling also received congratulations from his fellow contenders. It was a very positive and respectful moment, even in victory. After the singing of our national anthem and photo taking on the podium, the medallists went round thanking their supporters. Schooling made a short detour to pick up the Singapore flag to display to the photographers. Even in his victory lap, Schooling took the time to chat with his hero, Phelps. Everyone is wondering what they said to each other. 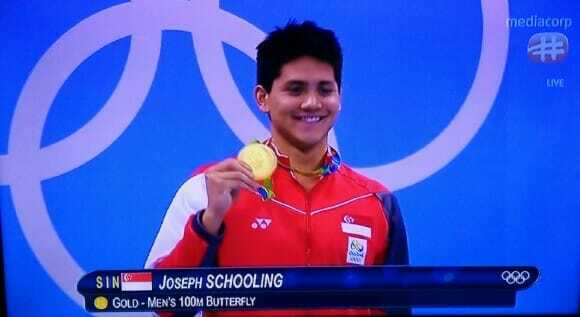 Hurrah for Joseph Schooling and all our Singapore athletes who are still giving their best shot for Singapore!